Those who are eagerly anticipating the newest installment in the long-running Fire Emblem series just got themselves an advance treat. Nintendo has announced that they will be releasing a new Nintendo 3DS XL boasting a design based on the upcoming Fire Emblem Fates video game. The system will be available on February 19 and will come with a $200 price tag. 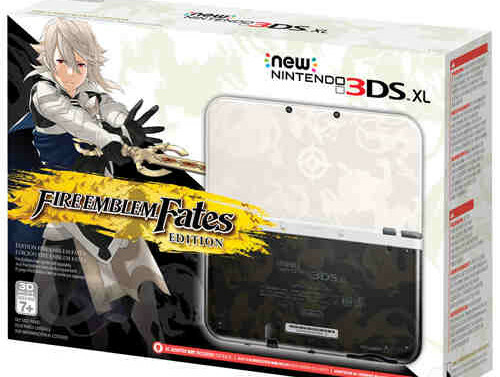 Do note, however, that the new 3DS XL will NOT come with a copy of Fire Emblem Fates. So, don’t forget to pick up the game, too. And similar to the trend that’s commonly associated with the Pokemon video game series, Fire Emblem Fates will come in two versions: Birthright and Conquest. Each version will come with a complete story and will be priced at $40. But don’t worry about missing out on the other; purchasing a copy of one version will give you a 50% discount on the digital copy of the other one ($20). So, don’t fret too much and instead spend your time looking at your Fire Emblem Fates-themed 3DS XL like it’s the best thing to come since pizza. Also keeping up with the Pokemon trend, a third version, titled Revelation, will be available soon after. Again, don’t worry about it too much because a special edition will also be released that will contain all three versions, plus some additional goodies like a 3DS XL carrying pouch. Said special edition will be priced at $80 in retail. If you can hold out a bit more, you can wait for the special edition to roll around. But if you don’t have the patience to sit out and want to get a piece of the newest Fire Emblem adventure, just toss a coin to decide which version to pick up. Fire Emblem Fates is the fifteenth overall game in the series and the second game to be released for the 3Ds following the critically-acclaimed Fire Emblem Awakening. One of the more noticeable aspects in the video game industry is the way video game systems would have their skins customized to promote an upcoming game. They’re a lot more stylish than the usual default colors and it also acts as a sort of collectible item, so it’s a win-win situation. They’re usually reserved for the more well-known video game franchises like Call of Duty and Final Fantasy. Of course, you can just have your default console pimped out manually by an artist, but having an official customized console is the more enticing option.